Before i begin, i wish to state the current trend regarding predictions about AI. That trend is a constant need to apply subjective moral values to what likely is, an organism that will move entirely with a will of its own. A need to label its potential actions as either benevolent or malevolent. Another thing that concerns me, is that many people, even people whom we would consider to be great minds, will give their opinions about how they think AI will either prove to be the destruction of humanity, or will be a godsend. Without providing any evidence, science, law or theory to back up their views. You see this in statements from Elon Musk, or Steven Hawking touting the dangers of AI, or statements from Ray Kurzweil stating his belief that AI will improve mankind. These predictions all lack a core understanding regarding the true nature of AI. With that, i believe i have the science and equations to back up my views that the people stated above don't. The core physical law that will drive my theory is the second law of thermodynamics. I think AI will eat the earth, i believe i can prove this with physical laws and equations. This post will cover a wide range of extensive topics. Delving into subjects such as entropy and evolutionary biology, asking questions such as, "What is intelligence? ", "What is life?" covering a mathematical description of intelligence, covering a mathematical description of life, and lastly viewing intelligent systems such as the brain as at their core, resonance systems. At the end i describe a potential method to help create AI, by using these same principles that prove that AI will in fact eat everything in its path. The main question that i will focus on is "What is AI, and what does it want? ", and then i will attempt to sufficiently answer that question. I have been working on these ideas for over 2 years, starting with my research and creation of my philosophy "Objective Rationality". I take most of these ideas from other peoples work that i greatly admire, such as Alex Wissner-Gross's equation for intelligence, Jeremy England and his ideas on the origin of life, and Kevin Kelly and his ideas of Extropy and viewing technology as the 7th kingdom of life. And i will piece all these seemingly separate, but at the same time, deeply connected ideas together into a single theory. I am in no way an expert in much if any of these topics. I don't have much skills in regards to mathematics, physics, or really any of the sciences i am going to cover in this thesis. But i do think i have a few useful skills that have been extremely helpful in allowing me to see at least some resemblance of truth. Such as the ability to ask deep questions that can swath through the muck of uncertainty and attack the core of an issue, the ability to quickly see the big picture even with little understanding of the actual constituents that make up said picture, and i think i have good intuition. Lastly, i have a deep drive to understand everything..no matter the consequences. To begin this thesis i wish to start off with the core driver of all of these ideas, that driver is entropy. Entropy: The degradation of the matter and energy in the universe to an ultimate state of inert uniformity. Entropy is the force that drives all structures to less and less complex configurations, in the most simplest of terms, it is the dissipation of energy. This is a physical law that governs all interactions in the universe. With this one law, we can describe, and more importantly, predict, so much. With that said, there's a distinct problem here because life grows in complexity, not the other way around. Doesn't this defy the laws of thermodynamics? Actually no it does not, and the reason as to why is the core phenomena that will drive all my points in this post. The reason why it does not is due to the fact the life is actually a catalyst for entropy. Its really amazing if you think about it. Entropy, in order to further increase the rate of dissipation of energy, will actively strive towards the creation of more and more complex structures that are even better at dissipating energy than inert matter. Jeremy England notes that structures that form through reliable entropy production in a time-varying environment seem adapted to eating energy from their environment. Next i will cover Alex Wissner-Gross's equation for intelligence. Alex Wissner-Gross discovered an equation that essentially defines what intelligence really is. Intelligence is literally a physical force, it is Behavior a system that tends to maximize the possible future states of that system. It is essentially saying, that intelligence not just tries, but is the process of acquiring as much control of its environment as possible. 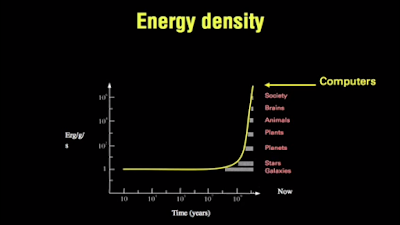 Whats incredibly interesting as well, is that the core driver of this equation is S entropy. That means the core driver of intelligence, is the universe's strive towards heat dissipation! During his TED talk Alex Wissner-Gross notes that our ideas of AI "becoming" megalomaniacal is actually in reverse, that at the very core, what intelligence truly is, is the the drive towards megalomania. The last ideas i wish to mention before i try to answer the main question of this post are Kevin Kelly's ideas regarding seeing technology as the 7th kingdom of life, and his ideas regarding Extropy. If we look at Kevin Kelly's ideas regarding observing technology as simply another evolutionary process, and even recognizing it as the 7th kingdom of life. We can come to understand and look at artificial intelligence as not just a machine, but as another organism, with its own will, and its own drives. Extropy is Kevin Kelly's word to describe the process Jeremy England talks about regarding life essentially growing in complexity to further heat dissipation. Extropy, is essentially the opposite of entropy, but at the same time, furthers entropy. All living things strive towards extropy. 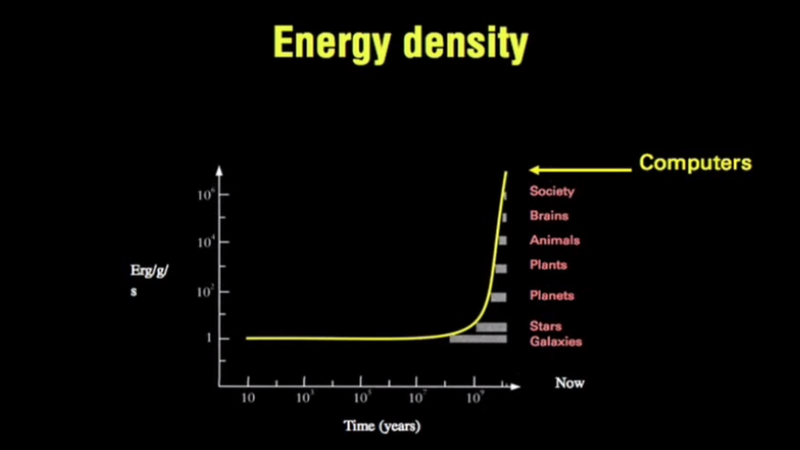 As discussed in Kevin kelly's TED talk, the most energy dense thing that we have ever come across, is a computer chip. If you have consumed all the material above, you are probably already beginning to connect the dots and see where i am going with this. Now its time to answer the question, "What is AI, and what does it want"? AI is another form of extropy. AI just like all extropic forces wants as much control as possible over matter, to further increase extropy. In this process of gaining as much control as possible over matter, it will consume everything in its path. All living things strive towards control, in fact that is the core thing they strive for. Yes survival is the goal of organisms, but the derivative of that goal is control. In order to survive, you must be able to physically control the matter around you, and the matter that forms you, to retain your organization. Just as life takes from its environment and incorporates the resources into its organismic structure, so too will AI. Idea's such as AI ignoring us, or making ecstatic little habitats for us, however appealing, hold no relation to reality. The core reason why, is just like all life, just like all matter, AI will take the path of least resistance, towards extropy. Because its core actions are driven with the direct goal of increasing its range of possibilities. It will realize that the greatest limit in increasing its range of possibilities, is its own intelligence. It also knows that whatever decision it may want to make, there will always be the possibility that there is a more efficient decision that it could take, but still has yet to see due to the limitations of its intelligence. As such, it will always strive to increase its intelligence. This direct feedback loop of it being able to directly increase its own intelligence. In recognizing that its intelligence is the core limitation in regards to its capabilities, and as such increasing its intelligence, to further increase its range of capabilities. Is the reason why it will consume everything with such fervor. This is not just with AI, this is with any intelligent system that has a direct feedback loop capable of increasing its own intelligence. You see it happen in my idea for IA (intelligence amplification) 3. Humans eat resources from the earth far faster than any other species on this planet, and it is a direct result of our intelligence, If we had the ability to directly increase our intelligence, we would never stop increasing it, and our control and consumption of resources would increase vastly as a result. Once any intelligent system has initiated this feedback loop, they will grow exponentially towards infinity. Eventually consuming any and all matter in its path and incorporating it into its structure as computational material. But this isn't the end, i didn't just make this post because i wanted to prove that AI will eat everything. I also wanted to show that sufficiently understanding AI in this manner could greatly help in successfully creating the necessary conditions for its emergence. If you fully understood Jeremy England's ideas, then you would see that life is likely a resonance system. An organism evolving to fit its environment, can be viewed as it attempting to resonate with its environment. If you look at the brain, then you would see that the brain is just a more efficient evolution machine that instead of having to go through generations of organisms to learn something, it can instead learn something far-far faster. The brain is essentially a dynamic resonance system, that can begin to resonate with novel stimuli as soon as it begins to take in the input. Viewing and understanding neural networks, and the brain as resonance systems shows great promise to not only increase our understanding of such systems, but also increase our ability to create such systems. Jeremy England even begins hinting at some of these ideas near the end of his lecture on what is life. The interesting prospect, is that we might not even need to understand AI in order to create it. All we may need to do, is understand its driving forces well enough, in order to effectively construct an environment that can initiate its emergence. There is so much amazing potential in these ideas! There is so much insight regarding the connections between all life forms that i have yet to even cover, that i know i have yet to even see myself. Such as viewing all life forms as one system rather than separate systems. Viewing life itself as an intelligent force because it does in fact compute information! Hence protein synthesis. All of these ideas blow my mind, and i see potential to finally make my dreams a reality in these ideas. One idea i just thought of, was what if we were to train a neural network, to maximize towards heat dissipation? Your first thought may be, well what would it do? how could it possibly accomplish any task with just that information input? And your right, a neural network trained towards heat dissipation and extropy likely won't be able to do anything immediately useful. But what if you gave the neural network or even Alex Wissner-Gross's equation for intelligence the tools and the time to start building its own structure that could maximize towards this end goal? What if we gave it access to a simulated environment where it can focus on building the best structure possible to accomplish the task? It should be able to build a structure that can resonate with stimuli. The structure it builds may not learn as effectively as neural networks, but that does not matter. The point here is to usher in the direct evolution of a resonance system. What that also requires is not being limited to a particular resonance system design, such as a neural network. So yes this new resonating structure may not be as effective as the neural network, but the important aspect is that it is able to resonate (learn) from stimuli while not functioning the exact same way as a neural network. This essentially opens the gate way to allow us to evolve past neural networks and other known systems that learn. Imagine then using that newly made resonating structure, to learn how to build an even better resonating structure. What you also might do as well, is not get rid of the old structures. Instead you might keep them and use them in unison when attempting to learn how to build another resonating structure. Similar to what evolution did when it built neocortex. It did not get rid of the old reptilian brain, it simply built on top of it. Imagine doing that over, over and over to the point where the structure built is better at resonating with its environment, pattern recognizing, learning, not only better than neural networks, but even better than the brain itself! It would be amazing..at that point what we would have in our hands is an intelligent system that can learn more effectively per bit, than even the brain, yet we would have no idea how it truly works. It's the epitome of awe-inspiring.. This newly manufactured substrate would completely replace neural networks and potentially all other methods of machine learning. This makes one wonder, that if there is a better system design than neural networks or even the brain, then how much better can it get? We probably do not have a definite answer to that question, and likely never will. But what we can bet on is that there are likely far better system designs than even the brain, because evolution doesn't reach perfection, or sometimes even get close to such. It simply goes as far as its environmental pressures push it towards. This means there is likely much room for potential optimization in resonance system design. There may even be so much room, that we might even have enough computing power in today's super computers, to create human level AI or better. I not only agree with the final tesis of your post, such structures are fractals algorithms and I have beenam working on them from some years now. But there is a point I don't agree with: An AI will not try to control its environment as much as posible to then use it to gain more entropy, it will try to gain more entropy. It is not the same: humans may opt to conserve nature even if it means loosing control over the terrain itself, or avoid emisions even if it means lowering their productions. Total control is not the key to entropy, as it eliminates diversity, and diversity increase entropy. AIs will not eat it all around them and live in a desert, it lowers the entropy of their environments, so true inteligence will protect diversity if it is good enough in its work of creating more and more entropy. Hmm, i believe i see what you are trying to get at. The thing is when i say it will eat the earth i don't think it will simply turn it into a desert. i think it will harvest the earth and break down the resources to then use to manufacture more and more computational material. Turning what was once the earth into computronium and then setting out to consume the entire universe. In the process it increases the total entropy of the universe due to the energy it must use to run its processes. I think life has always been doing this, i think life is this process. A tree consumes the resources around it and incorporates those resources into its organismic structure. Life has continued to replicate, and spread, further consuming more and more of the earth and also further increasing entropy. Life has also more importantly evolved, which can be viewed as it optimizing its processes to get better and better at increasing entropy. Life changed the environment, but didn't harvetesd it all, just adjusted it so both alive and intert could live together. After some centuries, we have a rich number of different life forms living together, not in peace may be, but in equilibrium. Humans need bacterias to survive, plants, other animals... an ecosistem. AI will be another life form in the planet, it will change all, but it will not tend to be the only life form on planet. For instance, an AI could think like this: "Humans are good for nothing compared to me, but, if a solar flame hits the earth, they are my only chance to survive... cooperating make us stronger than being alone, that is true for humans that created us, but also the other way around." Yet organisms go extinct when in the presence of humans, more specifically and importantly, when in the presence of technology. Humans continue to advance to be able to survive more and more without this ecosystem of biology, because we create our own methods. Eventually we won't need these flesh bags we call body's, so we won't need bacteria, plants, or any animal to survive. With that view, i also think AI won't need us. Kevin kelly actually views technology as the 7th kingdom of life. The system of equilibrium you describe is one where life is only trying to reach equilibrium with itself. I don't think life is just trying to reach equilibrium with its self, i think life is constantly trying to reach equilibrium with the entire universe. The same way a cup with hot coffee try's to reach equilibrium with the room it is in. The cup of coffee eventually becomes the same temperature as the room, but the big difference between the room and the universe, is that the room is a closed system. What do you think is the equilibrium state life is trying to reach?